自來水公司 - 舊討論區 - 巴菲特班 洪瑞泰 (Michael On) - Powered by Discuz! Companhia de Saneamento Basico do Estado de Sao Paulo(kaka哥滴SBS), or "Sabesp," operates in Brazil, and its financial performance and stock price will be significantly affected by exchange rates because a good chunk of its debt is denominated in U.S. dollars and Japanese yen. And SJW(NYSE:SJW) has significant real estate operations. Disregarding these two companies, there was a strong relationship between a water utility's size and its stock's performance in 2017. At the start of 2017, American Water(AWK) and Aqua America(WTR) were the two largest players, with California Water Service(CWT) and American States Water(AWR) tied for third. These four stocks were the best-performing in 2017. Conversely, three of the four smallest players performed the worst, with Artesian, which primarily operates in Delaware, bucking the trend. This dynamic isn't going to happen every year. In fact, the smaller utilities were the big winners in 2016. Though, as I noted in a Jan. 2017 article, that while some positive things can be said about them, "their small sizes combined with their lack of geographic diversity limit their long-term growth potential." The bigger players are more likely to have the resources needed to acquire smaller utilities. As I've previously opined, this is a considerable advantage because the water utility industry is quite fragmented, and municipalities that operate their own water systems are increasingly selling them because they can't afford to maintain and upgrade them. 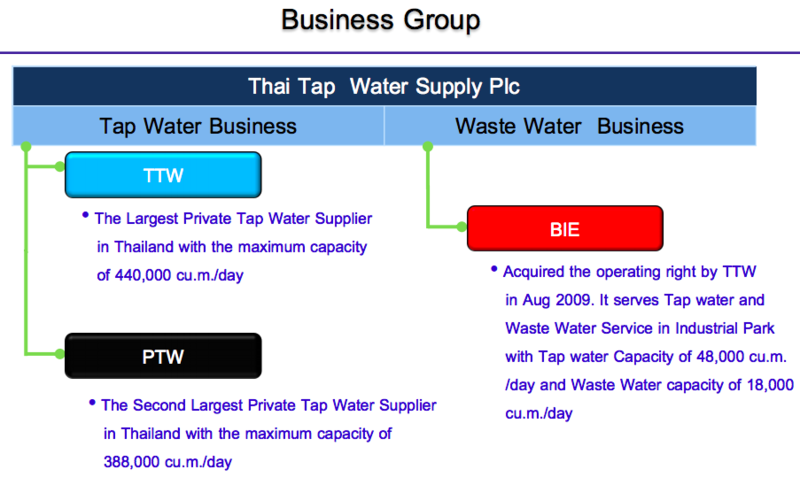 Thai Tap Water Supply Public Company Limited(TTAPY) is the largest privately owned tap water producer in Thailand.